Ok, I have a confession to make. I am a horrible breakfast eater during the week. Don’t get me wrong, I love breakfast, but with all the hustle and bustle of trying to get everyone out the door I normally have coffee in hand only to realize around 11:00 that I didn’t eat breakfast. I think this is why weekends are “special” breakfast time so we can all sit down and have a leisurely breakfast. Well at least we try, with soccer season about to start and and games scheduled for 8:15 a.m. we will see how it goes this fall. Anyway, I really do love breakfast and I think everyone should eat it. 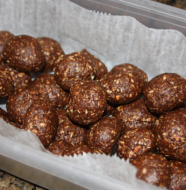 I always make sure the boys have something that will keep them going during the day, but unless I have something that is irresistible I will forgo breakfast. I am not really a morning person so I stay in bed until the last minute and then rush around making lunch, breakfast, snacks, and making sure that everything is in order for school. It is easy to get “too busy” to eat. When the boys are out the door, I sit down, catch my breath with a cup of coffee, and am already thinking of what’s next on the mental to do list. I have found that I do better about eating breakfast during the week if I have stuff on hand that is “irresistible” but still healthy and wholesome. (Well sometimes, keep checking back for some sinfully delicious breakfast treats.) I do love oatmeal and will be sharing some of my favorite ways to eat it, but after making it for the kids I’m not normally up for making myself a bowl. I really should just get over it and get up earlier to join the fam for breakfast, but then I couldn’t complain! So that is where today’s recipe comes in. It is one of my standbys that I can make and then have on hand for a week or two depending how fast we go through it. I love to have fruit and yogurt parfaits–especially with granola. At our house we almost always have fresh fruit, raspberries if Tyler was with me on my trip to Costco, as well as a large tub of plain yogurt. I like to buy Costco’s plain yogurt, sweeten it slightly and add vanilla to make our own vanilla yogurt without all of the sugar of store bought variety. William especially likes his yogurt this way and will even eat the yogurt plain when I have homemade granola on hand. 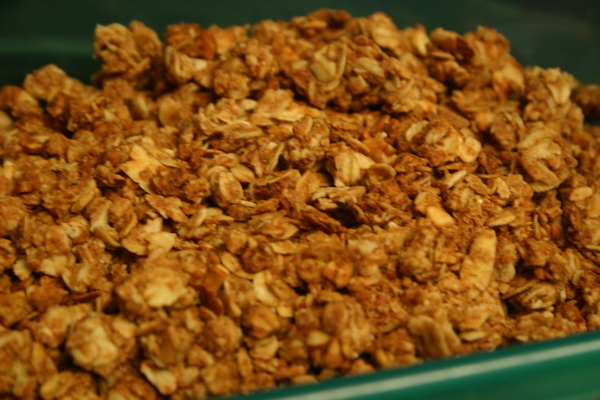 This granola recipe was one of Jeffrey’s favorites growing up and the smell reminds him of his childhood. I have tweaked it by adding more cinnamon and almonds. I am blessed to have a mother-in-law that shares her recipes and then isn’t offended when I add my own twists to them. I hope you enjoy this recipe as it is a frequently requested item when I cater breakfast for clients. When my boys find out it isn’t for them, they are quite disappointed. It really is delicious no matter what time of day you enjoy it. Now after all of this talk of breakfast I feel inspired to go get my cupboards stocked with all kinds of delicious treats so I don’t skip breakfast next week. Stir the following together in a separate container. 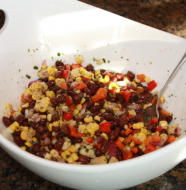 Add liquid ingredients to dry ingredients and stir until the are mix together thoroughly. 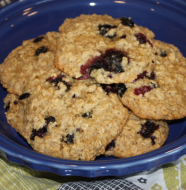 Spread the granola out onto a greased cookie sheet (or ungreased stoneware bar pan) and bake for 1 hour or until dry and golden. Stir about every 15 minutes. This is great mixed with craisins or dried fruit as a snack right out of the bag or use it to top your favorite yogurt. It is also good to eat as cereal topped with milk. This is what it looks like before it is cooked. 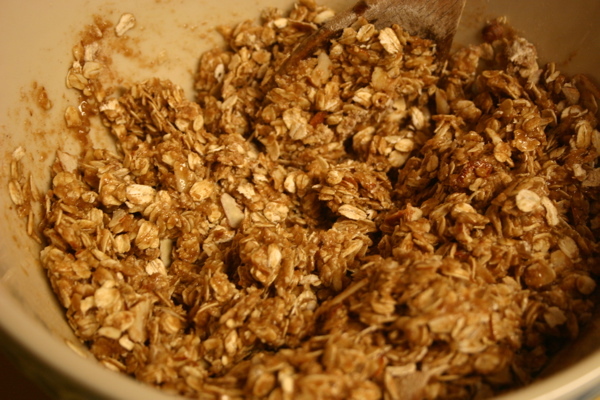 5 Comments on "Homemade Granola"
I am going to have to try this for the kids and me! It looks yummy! I would do it today, but no wheat germ. Gonna have to buy some!! Thanks for this one!! Do you use regular sugar to sweeten the plain yogurt? I love yogurt but hate all the sugar in the flavored varieties. Thanks for your posts! I do use regular sugar, but you could use brown sugar or even honey. I like to use 1/2 teaspoon per cup and then adjust to taste. I have been able to cut it down quite a bit and now actually like it more on the tart side. Let me know how you like it. The whole family loved this (even Joe). The boys and I ate it like cereal with milk!